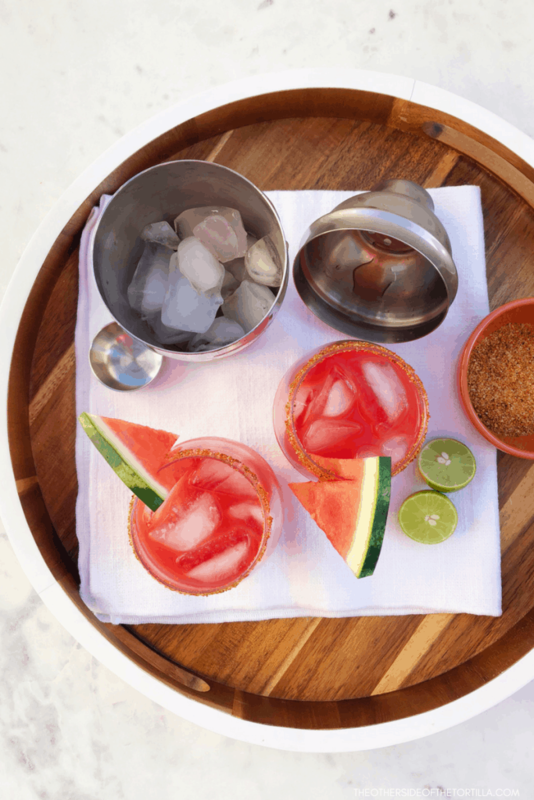 A watermelon margarita is a tasty summer cocktail that’s easy to make and also a great way to use up extra fruit. I can’t think of a better way to close out the final weeks of summer on the patio than a fresh watermelon margarita. Can you? These are also perfect for sipping by the pool on a hot day. This recipe calls for tequila blanco, also often labeled as “silver.” If you don’t already have a preferred brand of tequila you keep in the cabinet, and you don’t know much about tequila, at least stick to this one rule: don’t buy the cheap, crappy tequila. (Cough :: Cuervo :: Cough) It doesn’t taste good and it’s likely to give you a hangover. And if you get a hangover, you’ll need my recipe for “suero” which is basically like homemade pedialyte. Stick to buying tequila that can be sipped. It will cost more, but it will also make you like the taste of tequila instead of feeling sorry for yourself later. I’ve noticed my local Costco even carries good brands at decent prices if you’re looking to get the best bang for your buck. Huizache, Herradura, and Milagro are brands we’ve bought and kept in our bar cart. And if you’re interested in organic tequila, I also like the floral and earthy Tequila Alquimia Blanco. This recipe makes 2 servings and can easily be doubled, tripled, or quadrupled to make a pitcher if you’re serving guests (or whatever… no judgment!). 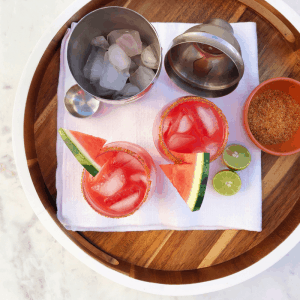 A simple recipe for watermelon margaritas that takes about 15 minutes to make from start to finish. 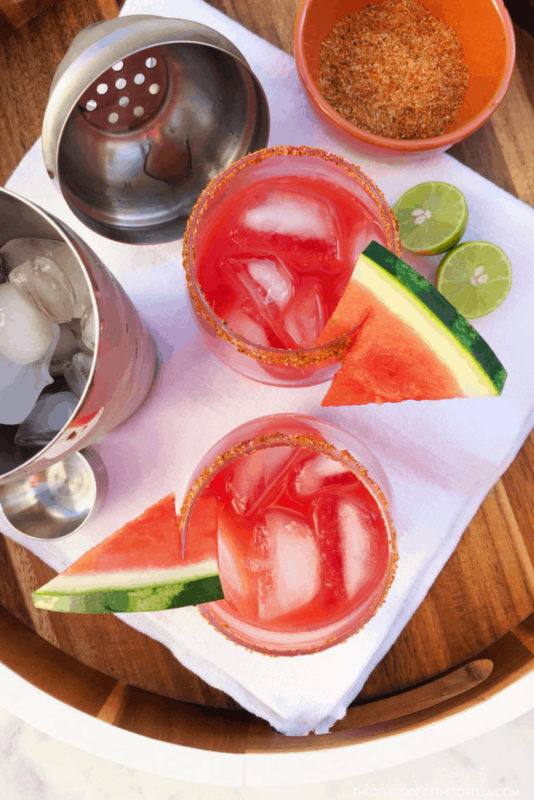 Mix 1 1/4 cup strained, fresh watermelon juice with 2 ounces of tequila and the juice of two Mexican limes. Stir and refrigerate or put in the freezer to chill for about 10 minutes. While the juice is cooling, use half of one of the juice limes to wet the rims of two glasses. In a shallow dish, pour about a tablespoon of Tajín and dip the rims gently to make the Tajín stick to the glasses. Add about 4-5 ice cubes to each glass. Fill a cocktail shaker half-full with ice. Pour the chilled watermelon, lime and tequila mixture into the cocktail shaker. Gently swirl and shake for about a minute. Strain margarita into glasses over ice and serve. If making your own watermelon juice: Cube 1 pound of watermelon and put through your juicer. Pour through a fine mesh sieve to remove any pulp. Refrigerate for up to 12 hours before using. For optimal taste, fresh watermelon juice is best consumed the same day.